Do you enjoy watching as failed businessman with dubious entertainment skills blithely sputters nonsensical absurdities and mirthfully belches offensive comments at everyone within earshot, all without realizing that he’s not the most likable person in the room? If not, you should probably avoid the news over the next few years. 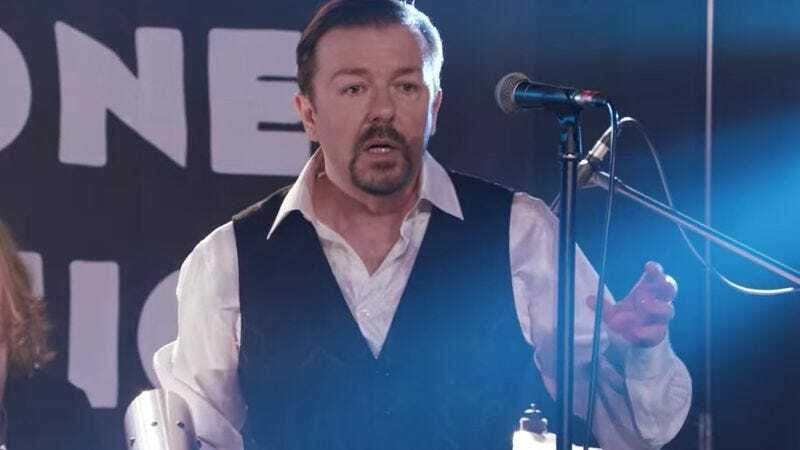 And one way to do that is to watch Ricky Gervais’ new mockumentary David Brent: Life On The Road, which will begin awkwardly streaming on Netflix starting February 10. The feature-length film follows the main character from his break-out BBC Two sitcom The Office, as he tours the U.K. with his rock/rap band Foregone Conclusion. It will definitely be somewhat uncomfortable, and some people will almost certainly be hurt (he does have a high-powered T-shirt rifle), but you’ll be able to soothe yourself with the knowledge that none of it is really happening. The film saw its British release in theaters back in August, but since it was picked up for U.S. distribution by Netflix, it will come to the states the way most people were going to watch it anyway: the Internet.